Concerned at rising Chinese influence since last year’s coup, the two countries adopt a pragmatic approach. The United States and Japan drew international attention this month, as both countries separately marked positive shifts in their relations with Thailand. 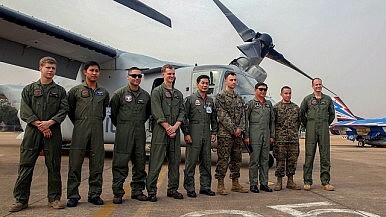 While the United States kicked off the annual Cobra Gold military exercises – the largest joint military exercise in the Asia-Pacific – Japanese Prime Minister Shinzo Abe met with Thailand’s Prime Minister Prayuth Chan-ocha, releasing a joint statement that called for broader bilateral economic ties. Both actions attracted significant attention, in part because Thailand is currently ruled by a military junta, which came to power following a coup in May 2014. Thailand is governed by martial law and officials have stated that the restoration of democracy will not happen until early 2016. This political situation notwithstanding, the United States and Japan affirmed their relationships with Thailand, both likely under with the intent of countering China’s growing influence in the region – the United States with security cooperation and Japan with economic aid. Thailand is a longstanding U.S. security ally in the Asia-Pacific, with the Cobra Gold exercises first held at a bilateral level beginning in 1982. Last year’s coup prompted the United States to suspend security assistance and cancel exchange programs with Thailand, as the U.S. is legally prohibited from providing military assistance to any country whose elected leader is removed from power by a coup. Yet China’s increasing overtures towards Thailand in the months since, particularly towards strengthening security cooperation, have been a cause for concern in Washington. Chinese military officials met with their Thai counterparts on February 6, and China took part in Cobra Gold for the first time this year. In an effort to balance relations with Thailand while signaling its concerns for democratic restoration, the U.S. compromise was to continue Cobra Gold while scaling back the size and scope of activities. While the United States has acknowledged the difficulties of the U.S.-Thai relationship, its efforts represent a good step in trying to balance its democratic values with its strategic interests in the Southeast Asia region. For Japan, Abe’s joint statement with Prayuth stressed the importance of quickly restoring democracy to Thailand, stating that “reform of the country towards a sustainable and inclusive democracy” is “crucial.” At the same time, the two leaders signed a memorandum of intent on cooperation, affirming Japan’s involvement in railway and other infrastructure development projects in Thailand. Like the United States, Japan’s relationship with Thailand was affected by the military coup, as Japan initially suspended high-level diplomatic exchanges with Thailand. Yet, as Japan’s direct investment in Thailand fell by 37 percent while China’s increased by 800 percent in 2014, Tokyo has sought to reestablish ties. With China seeking to strategically focus its aid on Southeast Asia through various economic initiatives such as the Asian Infrastructure Investment Bank and 21st Century Maritime Silk Road, Japan is more aware of its need to maintain positive relations with Thailand. According to the 2014 PEW Global Attitudes survey, China is well-regarded in Thailand, with 72 percent of the public generally perceiving the country favorably. The majority of Thais believe that China is the leading global economic power and 44 percent believe that China will or has already replaced the United States as the leading superpower (compared to 38 percent who believe otherwise). Yet in terms of Thailand’s greatest ally, the United States is still considered to be the primary partner, and Japan is even more favorably regarded than China, at 81 percent. A similar survey conducted by the Japanese Ministry of Foreign Affairs showed high approval of Japan as a “reliable,” “friendly” and “trustworthy” partner for Thailand. Like much of Southeast Asia, Thailand relies on all three countries: China is Thailand’s top bilateral trading partner, Japan is its largest foreign direct investor, and until the 2014 coup, the United States had provided millions in military assistance each year to Thailand through Foreign Military Financing and International Military Education and Training funds. The absence of the United States and Japan creates an easy opportunity for increased Chinese influence. With tensions and instability regarding territorial disputes and maritime law already prominent in the region, the United States and Japan need to be proactive in maintaining their positive images if they want to counter China’s influence in a meaningful and impactful way. There is a regional power balance at play in Southeast Asia, with the United States, Japan and China all active participants. The United States and Japan do not want to antagonize China, but they also do not want China’s influence – in Thailand and the broader region – to continue expanding. In the case of Thailand, both the United States and Japan focused on separate, complementary aspects – the United States on security and Japan on economic cooperation. This kind of coordinated activity allows the two countries to minimize the domestic fallout from supporting a non-democratic regime, while maintaining a positive presence in the region. This is strategic pragmatism, reflecting the aligned nature of U.S. and Japanese interests in Southeast Asia, and representing the potential for increased U.S.-Japan coordination in encouraging peace and stability in the Asia-Pacific region. Hana Rudolph is a Research Assistant with the East Asia Program at The Stimson Center, a global security think tank in Washington, D.C. The assumption that this coup will be like all the rest is based on flawed thinking. Why Thailand Returned the UyghursThailand Turns to ChinaAnti-Submarine Warfare Drills Put the Focus on US-Thailand Security TiesWhere Is the US-Thailand Alliance Amid the 2019 Cobra Gold Military Exercises?What’s Next for China-Thailand Military Ties in 2018?